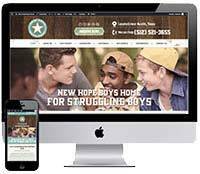 New Hope Boys Home offers life transformation to boys who are struggling with life-impacting behaviors, addictions or attitudes. They desire to see every boy reach his God-given potential. – boarding schools therapeutic and troubled teen schools. Should you need help finding schools for troubled teens, home for troubled youth, schools for troubled teens, or Christian therapeutic boarding schools, please let us know. When looking into boarding schools remember the distinction between different types of boarding school programs. The most common are therapeutic boarding schools which are specifically designed for at-risk teens. These boarding schools, sometimes called reform schools, wilderness schools or emotional growth schools, combine therapy with academics to help kids get back on track. Another category of residential schools is Christian boarding schools. Students attending Christian boarding schools will receive both therapy and education from a Bible-based perspective. Parents sometimes first look for military schools or boot camps, but these boarding schools do not offer a long-term answer to teen rebellion. This site includes a list of the best therapeutic boarding schools, best residential treatment programs for teens, best wilderness programs, best outdoor therapeutic and best adventure therapy programs. Boarding Schools (Emotional Growth Schools and Therapeutic Boarding Schools) provide supervision and counseling for at-risk teenage boys and girls.